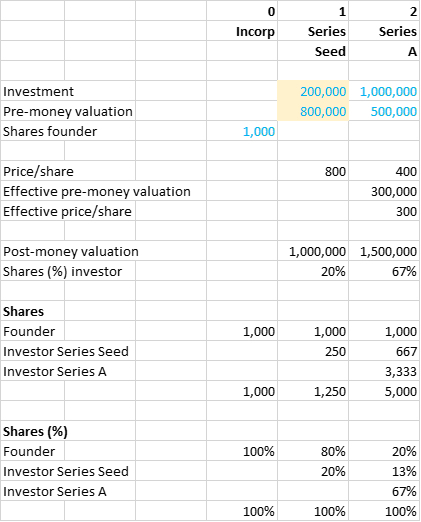 / Guest post / From term sheet to spreadsheet: how does anti-dilution work? What is an anti-dilution clause and what does that mean for founders, investors, and the amount of shares? Joachim Blazer explains and reveals the numbers behind such a construction. 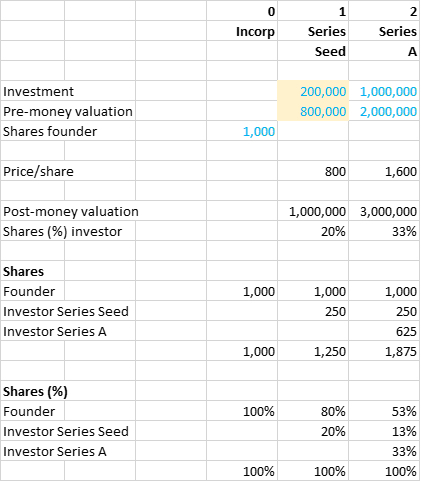 From term sheet to spreadsheet. Let’s translate this term sheet into a spreadsheet. Given my cashflow planning, I expect that I also need to raise a Series A. Assume $1m at $2m pre-money. That means a price of $2m / 1,250 = $1,600 per share. Now I get how anti-dilution works. Joachim Blazer is a corporate finance advisor. He helps founders get the best venture deals. Contact him at hello@joachimblazer.com. This post appeared first on his blog. Main image by StartupJuncture, made with Infogr.am.